I woke to the sound of my alarm and to the sound of loons calling from the lake. What I didn’t waken to was the sound of rain on my tent. Hooray! 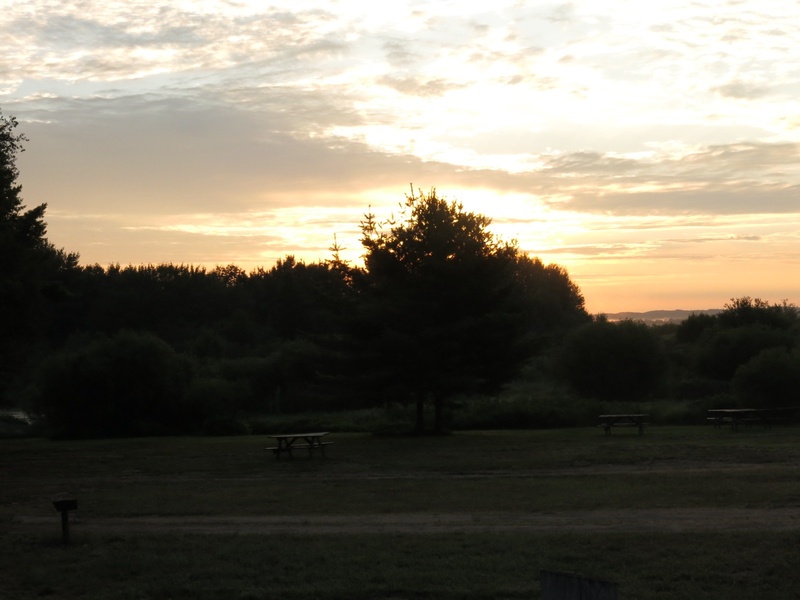 Actually when I emerged from my tent there was a beautiful sunrise to greet me. We had a long ride ahead of us and our galley crew was cooking tonight so we wanted to get an early start. Michel was back riding with Elaine and me today. The three of us set out just after 7:30. 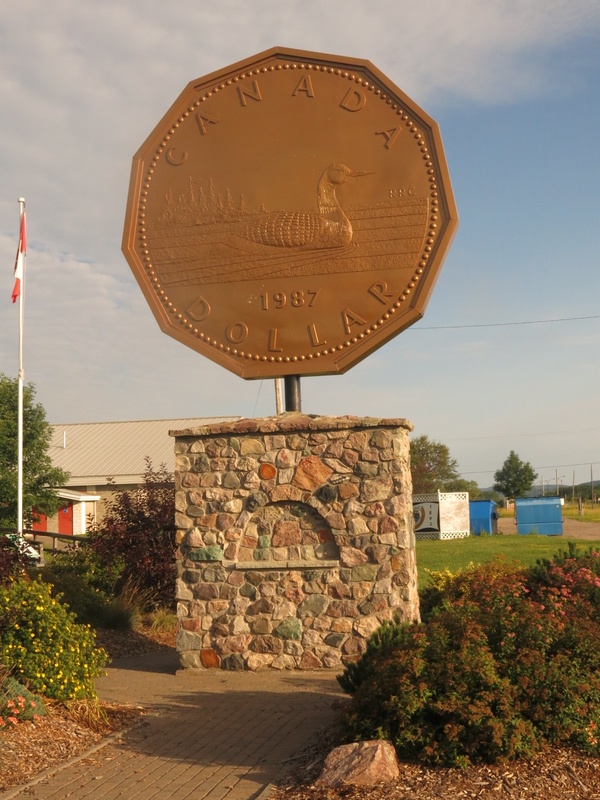 In Echo Bay we stopped to see the world’s largest Loonie. The giant Loonie is dated 1987, the year of its launch. Both the loonie and the hand sculpted giant replica we designed by Echo Bay artist Robert Ralph Carmichael. We couldn’t believe it. We actually rode 19 km before hitting our first hill! But then we were into rolling hills for a while. The road was also very rough. One hill in particular was quite steep. My Garmin registered a 13% grade before it stopped registering any slope while Elaine’s Garmin registered 15%. Fortunately it wasn’t too long but it sure was a workout! Stopping for a snack in Leeburn we discovered the whole town (3 houses), and church were all up for sale. We decided to pass on purchasing anything but did take the opportunity to strip off an outer layer. It was starting to get warm. A chocolate milk stop in Thessalon and a Tim Hortons stop in Blind River rounded out our day. For part of the way we rode alongside the north channel of Lake Huron. It was quite scenic. Across the channel is Manitoulin Island where we will be tomorrow night. 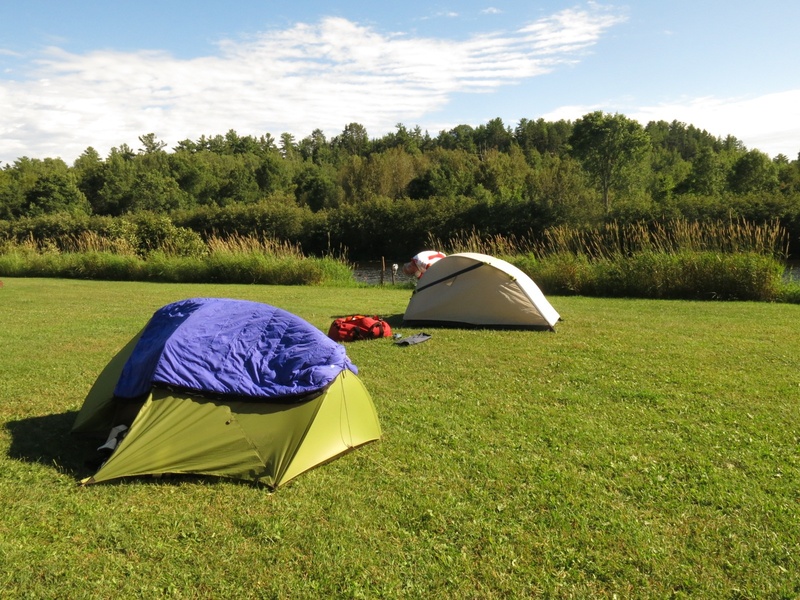 We arrived after a 172 km ride around 4:00 in the afternoon just in time for me to set up my tent, have a shower and start cooking dinner. The main course was Peanut Chili, an interesting vegetarian Chili with peanuts, raisins and tofu. It sounds weird but was actually quite good. It was a pretty good century ride today. It was very scenic and the second half was fairly flat which made for easy riding. But the best thing was the sunshine! It’s now 11:00 pm and a train just went rolling by about 100 feet from my tent. I could feel the ground vibrating. It must be bedtime!